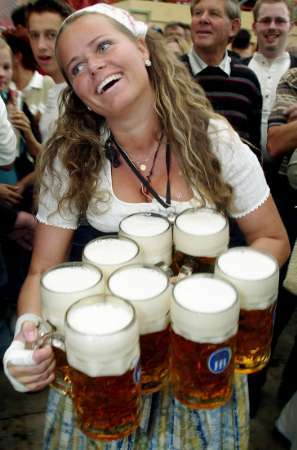 Organizers said 6.9 million litres of beer were consumed at the 179th Oktoberfest, as the biggest folk festival in the world came to end in Munich on Sunday. The annual German beer festival that opened on September 22 drew 6.4 million visitors from around the world, down from the record 6.9 million who drank 7.5 million litres of beer in 2011. The local Red Cross reported that more than 800 people drank themselves into state of unconsciousness over the course of the festival. A police spokesman the department responded to 2,000 and had been strained to its "limit and beyond" as a result. Much of the crime, however, was confined to pickpocketing. Some 116 oxen and 57 calves were eaten this year, with the beer to wash all those meals down costing up to 9.50 euros (12.40 dollars) per litre.